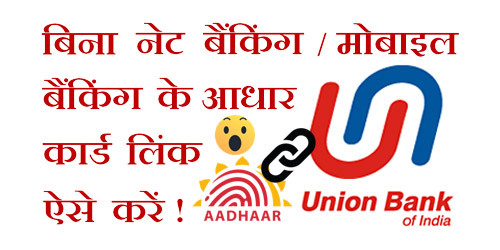 pixel How To Link Aadhaar Card With Union Bank Of India Account Online in Hindi ? How To Link Aadhaar Card With Union Bank Of India Account Online in Hindi ? How To Link Aadhaar Card With Union Bank Of India Account Online ? 1.) Union Bank Account No. (15 Digits). 2.) Re-enter Union Bank Account No. (15 Digits). 4.) Aadhaar No. (12 Digit). 5.) Re-enter Aadhaar No. (12 Digit). 6.) Name (as per Aadhaar Card). 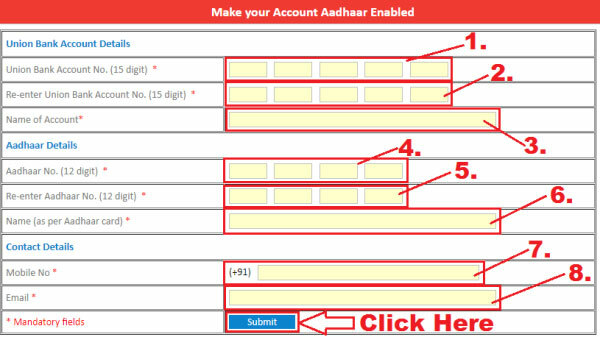 Example - Account Number Space Aadhaar Number And Send it To - 09223008486. उम्मीद करते हैं कि आप समझ गए होंगे - How To Link Aadhaar Card With Union Bank Of India Account Online. 1.) How To Open Account in Union Bank Of India Online Step By Step in Hindi ? 2.) How To Check Union Bank Of India Account Balance Through Missed Call ? 3.) How To Link Aadhaar Card With Canara Bank Account Online in Hindi ? 4.) List Of All Indian Banks Toll Free Numbers And Their Websites - Must Read ! 5.) How To Link Aadhaar Card With Central Bank Of India Account Online in Hindi ?